All vehicle specifications, prices and equipment are subject to change without notice. Prices (including the amount down payment) do not include tax, titles, tags, $779 dealer fee, dealer added accessories, Hyundai Certification, or other fees required by law or lending organizations. The estimated payments may not include upfront finance charges that must be paid to be eligible for the purchase financing program used to estimate the APR and payments. Listed Annual Percentage Rates are provided for the selected purchase financing or lease programs available on the current date. Program expiration dates reflect currently announced program end dates, but these programs are subject to change at any time. 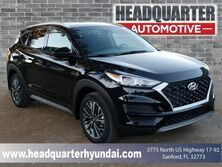 Sale price is net of all factory incentives including customer cash, bonus cash, owner loyalty, college grad, military rebates, and any competitive programs offered by Hyundai. The only exceptions: vehicles driven over 400 miles, vehicles that have been in an accident, or vehicles whose condition has been altered. Welcome to Headquarter Hyundai, a family owned dealership in Sanford, Florida since 2013. Here we make is easy to find, service and finance the perfect new or pre-owned vehicle. From the financing to the shopping process, we streamline every detail to help you save time and money. Choose from a great selection of new Hyundai models, including the Elantra, Santa Fe, Kona and many more. We also have a large inventory of pre-owned models to choose from, including sedans, trucks, minivans and crossover SUVs at the best prices. Whether you’re interested in leasing or purchasing your next vehicle, our team of experts will help you find the right auto loan or financing. Need quality automotive service? Stop by our Hyundai factory certified service center. There our dedicated master service technicians can help with anything your Hyundai might need. From major repair to routine maintenance, there is no project too big or small for our team. Stop by and see us today!